Deep within the Kingdom of Cambodia, tucked behind the backstreets of it's capital Phnom Penh, you will find a CrossFitter's hidden treasure and a very special affiliate, CrossFit Amatak. The majority of citizens in south-east Asia, unlike us Westerners, are not stationary desk-workers who require the hourly workout fix to keep functioning. You don’t see many gyms in developing countries because exercise is your job, it’s called farming or doing manual labor to put food on the table. Despite this, Cambodia has a thriving CrossFit box. 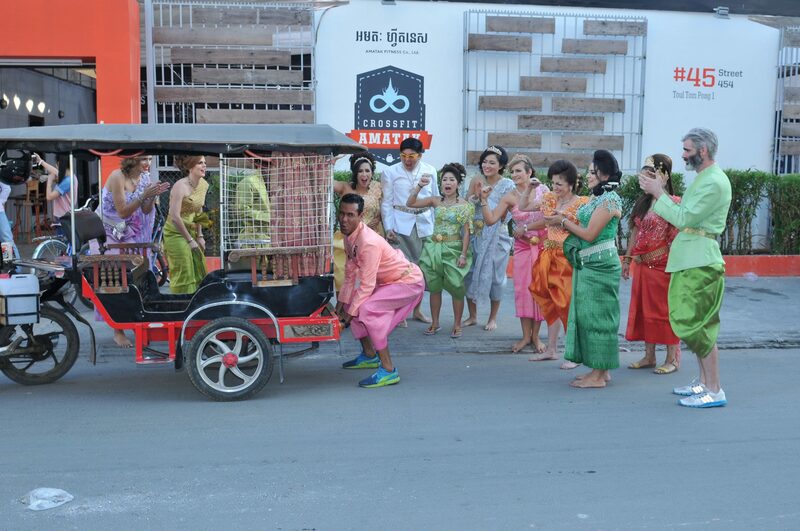 CrossFit Amatak is the only box in Cambodia. The nearest affiliate is over 500km away, in a different country (Thailand, considerably more western than it’s neighbouring countries). 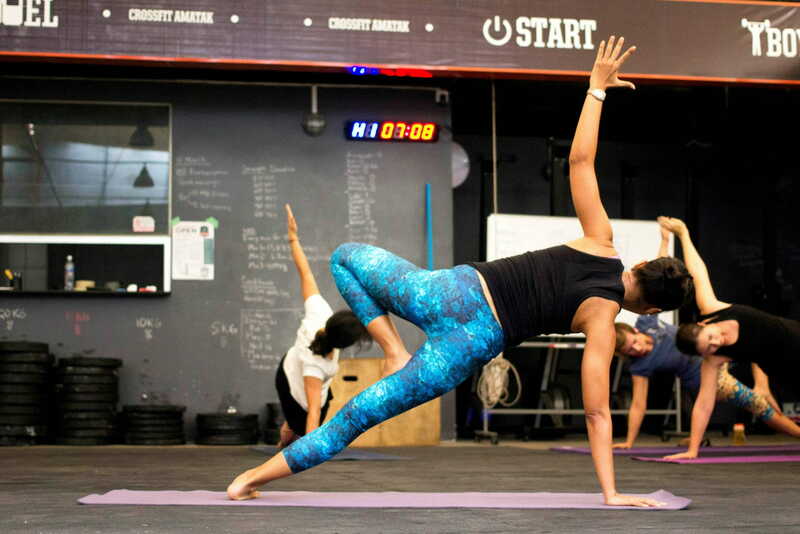 With less competition around it, Amatak resonates the ‘old school’ Crossfit feel, with a bustling and welcoming community. To this day, it remains my favourite box I have visited whilst travelling. Expect to be welcomed by the coaches as well as the other athletes. Come early to get a coffee, stay late to get breakfast or lunch. 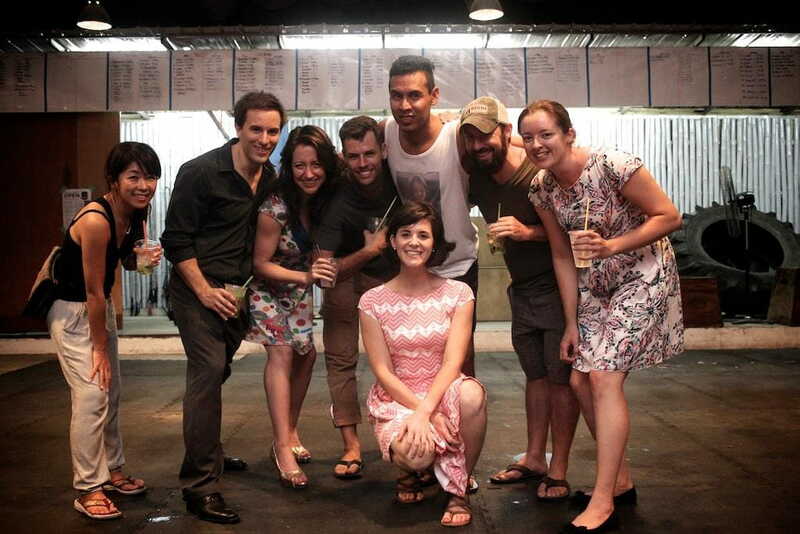 Expect to have conversations before and after and feel like it’s not your first time at CrossFit Amatak. There are several gyms in Phnom Penh… but most cater to the walking while playing games on the iPad crowd. Corbett, thank your for being here. Why did you open your own box in Cambodia of all places? I had personally become curious about CrossFit prior to leaving Washington D.C. in 2011 , but as my wife and I were saving for our move to a new country and with no set job on the horizon, I could not take the plunge to sign up. After we had settled into life here, the inexpensive food and cheap started to catch up with me and I began to research more on CrossFit and see what I could do here. There are several gyms in Phnom Penh from all levels and price points, but most catering to the walking while playing games on the iPad crowd. I was fortunate enough to meet James Pond who was running an NGO here with is wife and was also a certified trainer in several areas (CrossFit as well as personal training, kettlebells). He volunteered to re-teach me the basic lifts and we did workouts in a CrossFit influenced way. A few of my friends joined up and over the course of the following year when James’ job called him out of the country for longer and longer stints, I started coaching some bootcamp classes in the parking lot of our local gym. The programming was done remotely by Seth Johnson, a good friend James introduced me to who was doing CrossFit in the US (Jacksonville Florida). 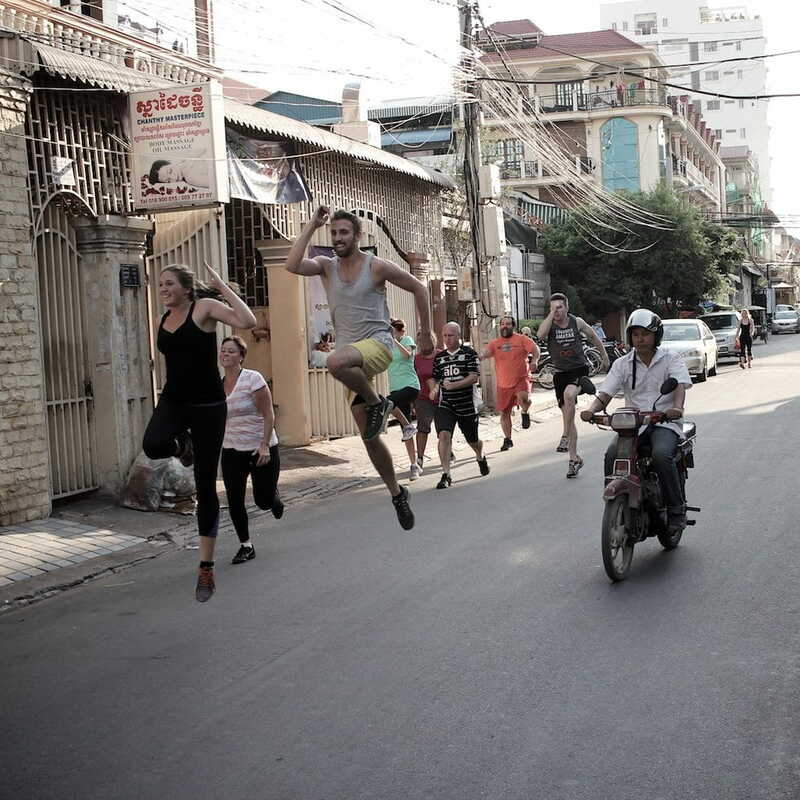 We had a couple of barbells, no kettlebells and a rebar covered pullup bar; we did our workouts between parked cars, occasionally doing partner carrys on the Cambodian streets, giving a bit of entertainment to the local community kids. Flash forward another 10 months and I’d decided to take the plunge and open up a dedicated facility. I did my CF L1 certification in Japan in spring of 2014 where I met Mike Titzer, who would end up becoming my head coach. We opened our doors in August of 2014 sending 100% of our veterans through a dedicated On Ramp course to establish all the foundation movements and we’ve been growing ever since. 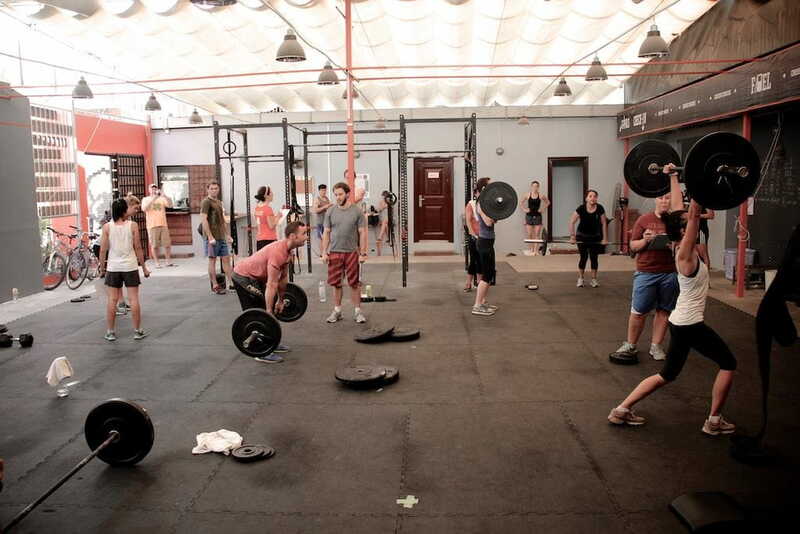 How does the CrossFit (or fitness) scene in Asia compare to the western world? I don’t think it’s good to compare all of Asia to the rest– I’ve lived in Korea and Japan and travelled a lot in Asia and there are very different characteristics throughout. But, one thing I do believe is that fitness, as a chosen activity, is actually the product of a matured economy. You don’t see many gyms in developing countries because exercise is your job, it’s called farming or doing manual labor to put food on the table. Driving the streets of Phnom Penh with its new mall and fashionable coffee shops, one might not realize that almost 80% of the population is still rural, the majority of the population does not have a toilet and the average income per person is less than $700 annually. So, the various gyms, pools and kickboxing/MMA facilities that are popping up in the capital cater to a few Cambodian elites, the small emerging middle class, and a LOT OF EXPATS (Westerners and expats from all other parts of the world)– the rest of the country get their fitness from farming the land, working all day in a factory and the occasional game of football. What makes your box so unique from others? We have over twenty nationalities in our membership, from Mexico to Canada, Sweden to Italy, Australia, Portugal, Switzerland, Germany, Singapore, Korea, Cambodia (of course) and most recently Fiji. Phnom Penh is a special place that attracts a lot of very smart people trying to do good things. This carries over into our box. We have a very strong and supportive community with above average education (most have graduate degrees, including our coaches). We do introductions in every class to make sure everyone knows each other and the many drop ins feel as welcome as our regulars. We are probably one of the most diverse boxes around. We have over twenty nationalities in our membership, from Mexico to Canada, Sweden to Italy, Australia, Portugal, Switzerland, Germany, Singapore, Korea, Cambodia (of course) and most recently Fiji. The best days for me are when we do our introductions and find that every athlete is from a different country. 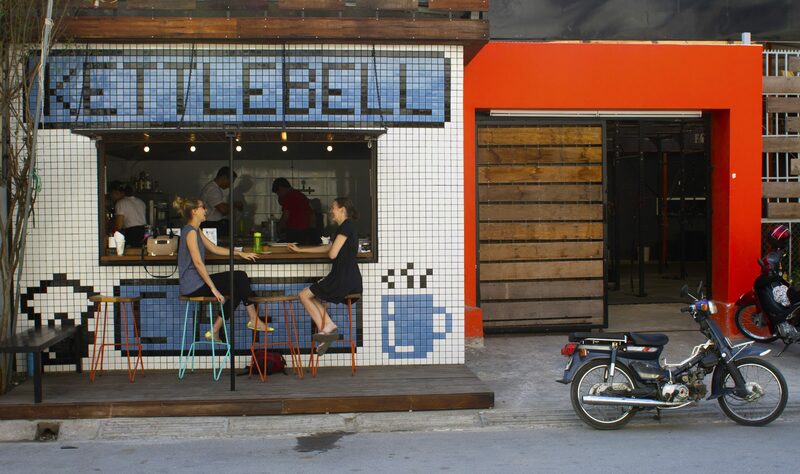 Did I mention we have paleo-inspired café and the best damn coffee this side of town? I think that also helps. What does your member structure look like? 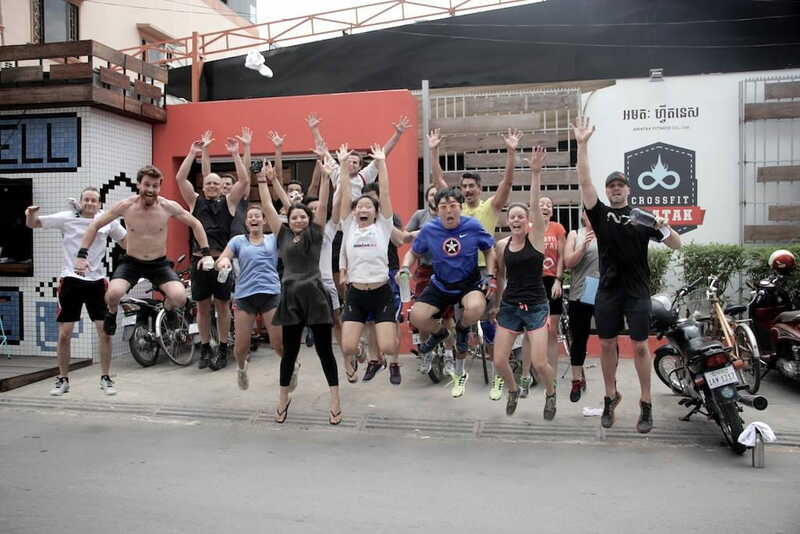 Excluding our bootcamp classes, which often acts as a jumping off point for future crossfitters, we are majority supported by the expat community with only about 5% of our current members from Cambodia. There are several reasons for this but the main ones are that our classes are in English and the cost associated with CrossFit. The younger Cambodians who would be most interested in CrossFit but earn much less than most of the expat community. This plus the requisite level of English makes it difficult for many. That being said, we are looking at scholarship opportunities for those who show the dedication and willingness to put in the effort. The English level in Cambodia is quite good, so the limiting factor tends to me more financial than linguistic. As a former international development professional, I don’t believe in 100% subsidization. We think people need to put some skin in the game but that being said, when someone demonstrates they have the discipline and commitment, I’ll find a way to get them in. We are 60 percent female. I think this is a result of our membership basis coming largely from the international development community, which skews the same. Nutrition is introduced in our On Ramp class and then brought up periodically; we also did our first “Paleo” challenge in January and we will make this an annual event. Since we’re closed on Sundays, our main programming is M/T/W/F/SAT. On Thursday we offer 2 yoga sessions as well as mobility and “skills & drills” session where we focus on one area each week so our athletes an work on form or learn how to open up specific areas of their body. This is included with our monthly and annual CrossFit membership. What do you offer for your members for outside the box? We have one of the tightest knit communities I’ve run into. It’s not uncommon for drop ins to be invited out to an event with some of our members or at worst, be given a dozen or so recommendations on things to do in the city during their visit. The most unique thing that we’ve probably done is the Khmer (Cambodian) wedding photo shoot. This was organized by a few of our most “energetic” members and involved about 2 hours of makeup and costuming preparation for our women (the men skipped the makeup) and then some of the most interesting deadlift and rowing photos you’re likely to run into. 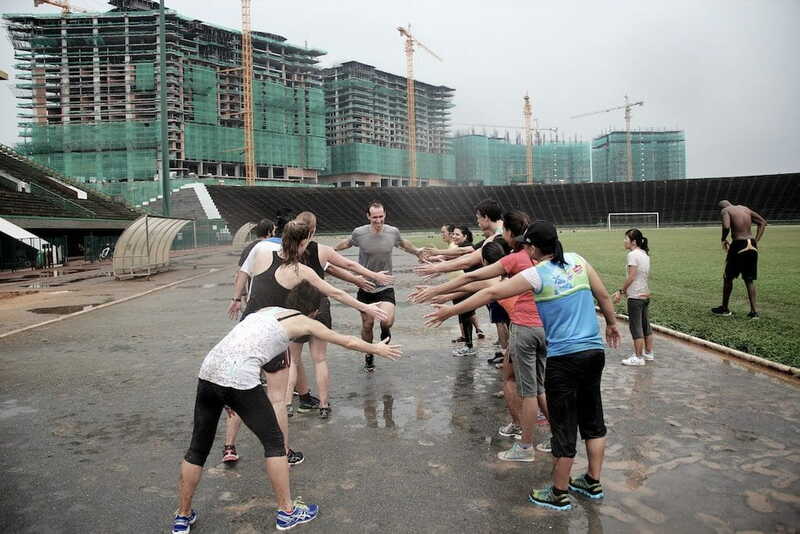 We also do a track workout every few months which has a bit of a CrossFit meets field day feel. A lot of our members came from the running community and last December we organized about 25 members to do the Angkor Wat half marathon (or 10K) up in Siem Reap (two of them did it in clown wigs go give you an idea of our membership). Following the close of this years Open, we held a party with an entire pig roasted on a spit outside our doors, locally brewed craft IPA beer on tap and an awards ceremony for our box. This all commenced after our Coach and a few others completed 15.5 in the evening (most people did the WOD in the AM), with about 40 others cheering them on in the background, beer in hand. If I start as a beginner -what does my training in the first month look like? Our coaching has received top notch feedback. Head Coach Mike Titzer and Coach Jenny Titzer share my belief in a strong foundation before pushing athletes and I’m the first to admit that my own form has a long way to go. Our foundations On-Ramp is 6 classes over 2 weeks, and is required of all new members. Even after this we keep a close eye on graduates until they have good enough form to start putting on much weight or increased intensity. We’re not a box that is going to produce any athletes at regionals anytime soon, we’re young but maturing and we’re dedicated. Why should I travel to your city/box? What else can I expect? Thank you Corbett Hix for taking the time for talking to us and thank you CrossFit Amatak.